What a wonderful place for a large family or several friends and families to take a beach vacation. This large, four bedroom home comes with must-have amenities and is a short distance to beaches, restaurants, and nightlife. There’s tons of indoor and outdoor space to hang out in, and air-conditioning throughout keeps everything comfortable. 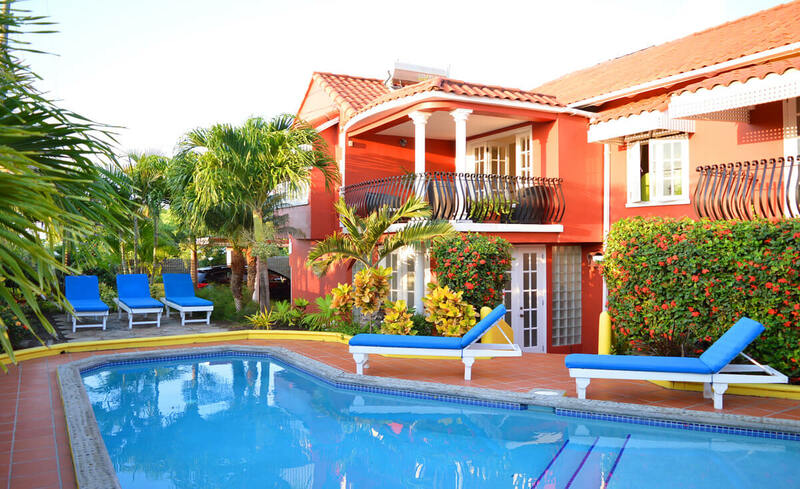 Villa Amarillo is a Spanish style, 3,500 square foot property with a full concierge and maid service. This family-friendly villa features WiFi and free parking. Manicured gardens surround the swimming pool and terra cotta terrace. A dining gazebo and BBQ grill sit to the side, and there’s a private outdoor shower for rinsing off post-swim. The wraparound deck shades a dining table and several living areas, which all overlook Grenada’s south coast. Several French doors open to the common area, which incorporates the living room and kitchen. The living room has a 42” flatscreen TV with cable and a sound system, while the kitchen is fully equipped with Kenmore stainless steel appliances. There is also a laundry room with a washing machine, ironing board, and iron. Villa Amarillo includes two air-conditioned bedrooms on each level. All four suites have an ensuite bathroom, four-poster bed, and exterior access. Upstairs, one of the king suites has an alcove and a private balcony that overlooks the pool and lush gardens. The other king suite has a twin bed and a private sun deck that overlooks the sea. Downstairs, there are two queen suites with French doors that open to the gardens. One has a sitting area with a sofa and vanity. Amarillo is close to the island’s best restaurants, nightlife, and beaches. The villa is also 5 minutes from St. George’s University, ideal for visiting parents. There are several local dive shops to enjoy Grenada’s world class diving and snorkeling.